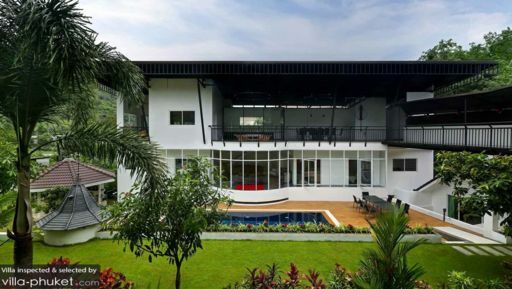 Villa Nap Dau occupies a sprawling land area in Chalong. Enveloped by verdant greenery, with sweeping views over the valley, the villa is a great bet for vacationers seeking a scenic hillside holiday home. With eight bedrooms, multiple living spaces spread over three storeys and a large garden, Villa Nap Dau accommodates up to 16 guests, and is well-suited for hosting weddings and social events. With eight bedrooms spread out across the property, Villa Nap Dau will comfortably accommodate groups of up to 16 guests. All rooms feature air conditioned interiors, quality linens, ample storage space and private en suites. 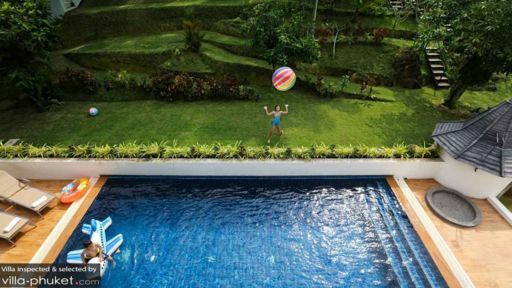 A spacious garden wraps around the sparkling pool. Around the pool area are sun loungers and an outdoor dining set. There’s a bathroom located right by the poolside for your convenience, and the deck also leads out to a sala with a bar and lounge area. The grounds are immaculately maintained, with flora and foliage peppered across the grounds. Let your little ones run free, play a game of volleyball or roll out yoga mats for an invigorating outdoor class! The outdoor space also doubles up as a venue for weddings and social events. Expansive floor-to-ceiling windows frame the living area, drawing the eye out towards the beautifully landscaped grounds. The living areas are sunlit and generously proportioned, with a lounge, entertainment room, veranda, dining area and fully equipped kitchen. A five-member on-site team delivers impeccable service. Airport transfers, bicycle rental, driver service, personal chef service, child minding service, in-villa dining and in-villa spa treatments are available at additional cost. 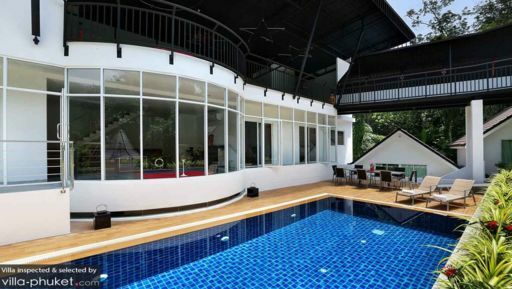 Villa Nap Dau is located in Chalong Bay, along the east-central coastline of Phuket. It’s the island’s largest boat anchorage, with sailing races and boating activity taking place regularly. The suburb lends itself to couples and families with its lifestyle establishments, seafront restaurants and cultural attractions, and serves as a point of departure to popular offshore attractions like Coral Island. Chalong Bay offers a narrow beach, with waters that do not lend itself to swimming or snorkeling. However, the bay is great for sailing and kite surfing (between the months of November till February), and there are excellent waterfront dining options at the pier. For snorkeling or kayaking, your best option would be to book a day trip to the neighbouring Coral Island. The island is accessible via a 15-minute speed boat ride from Chalong Pier. You’ll find restaurants, cafes and waterfront venues about 15 to 20 minutes’ drive from your villa. Check out We Café Salad & Coffee for its healthy wraps and salad offerings, Coffee Tribe for delicious breakfast mains, Rossovivo for wood-fired pizzas and pastas and Wok Pagoda for excellent Thai-Western fusion fare. Ao Chalong Yacht Club Restaurant is a great option for upscale waterfront dining. Kan [email protected] Restaurant also boasts sweeping sea views, and lends itself to diners looking for a more relaxed, fuss-free setting. Rum distilleries, viewpoints and beautifully preserved old towns are about 15 to 30 minutes’ drive away. Enjoy views out to the coastline and offshore islands from Windmill Viewpoint, or join in a tour at Chalong Bay Rum Distillery to get a close-up look on rum production. The bohemian Phuket Art Village, featuring a collection of home studios and galleries is a must-see for art lovers. Phuket Old Town offers a great family experience; you can visit the museums, explore the town’s myriad cafes and restaurants and go for a stroll to take in the quaint Sino-Portuguese architecture.